Our dazzle black New York Dazzle sequin overlays are a popular choice for adding a little sparkle to any featured table. They are an elegant addition to a cake table or head table to really make the rest of your decor pop. 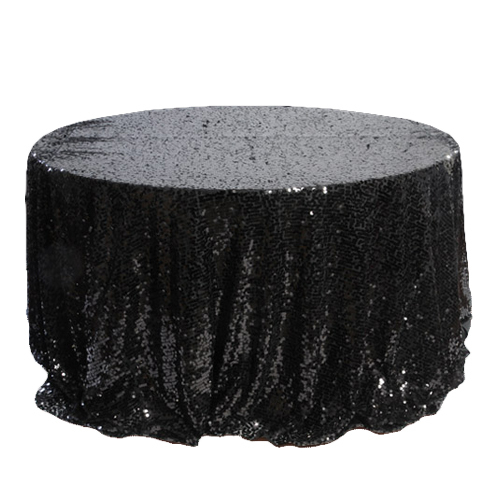 Our Black New York Dazzle tablecloths are designed with a mesh backing with hundreds of medium sequins embroidered on top of the mesh to provide an elegant black sparkle to the tablecloth and give it a solid design. We do highly recommend the use of a full-length table linen underneath the mesh tablecloth to hide the table top and legs. All over sequin stitched on taffeta.